Fashion Polish: Zoya Naturel Deux (2) Swatches and Review! 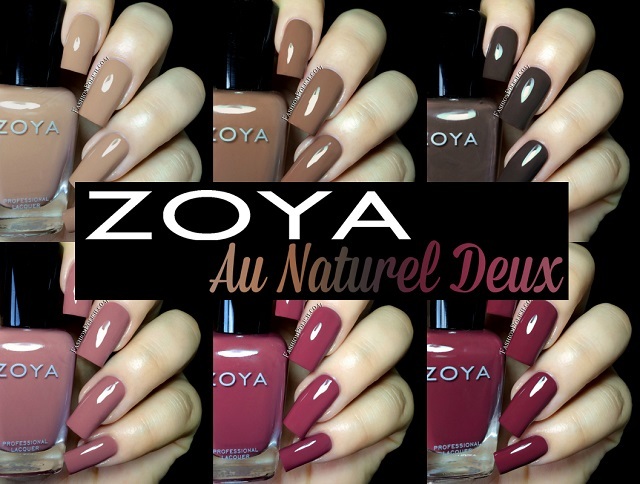 Today I have swatches of the Zoya Naturel Deux (2) collection. A variation on the first Zoya Naturel set with deeper tones. Formula was nice and easy to work with on all six shades : creamy, even and opaque in 2 coats. Spencer is a camel toned neutral creme. I was particularly surprised by how smoothly it applied. This is 2 coats plus topcoat. Chanelle is a warm medium brown creme. A delicious brown, perfect for the Summer-Fall transition. Again, perfect in 2 coats. Emilia is a dark chocolate creme with a cool hue. This one screams Fall to me. If you love browns, you'll love it. Shown below : 2 coats plus topcoat. Madeline is a muted rose creme. Girly pinks aren't my thing but I'd definitely see myself wearing this one. Creamy and smooth in 2 coats. Marney is a medium mauve creme. I found it particularly complimenting on my skin tone. Another easy 2 coater. Aubrey is a deep warm plum creme. A classic Fall color with perfect formula. Two coats for complete coverage. What do you think about this collection? Are you on the lookout for deeper tones in the Fall?